I am not sure how many people know about this. 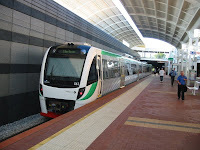 The WA Government started on the 4th April 2009 to offer free public transport travel to seniors between the hours of 9am and 3:30pm on weekdays, as well as all day Saturdays and Sundays and public holidays. This includes all of the public transport network - buses, trains and ferries. Eligible seniors need to get a seniors smartrider from the WA Seniors Card Centre. This is a great way to make the most of buses that will be travelling along the public transport routes during these times anyway. This was originally posted in 2009 when the program first started but perhaps someone out there might benefit from this repost.